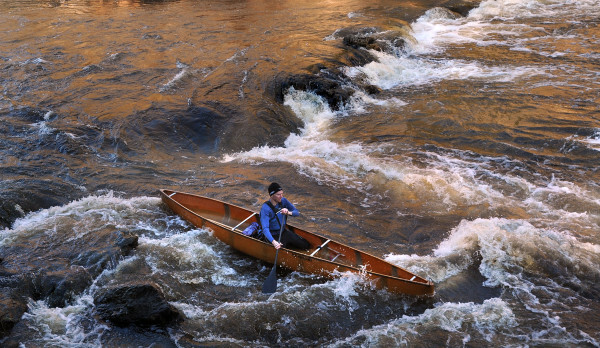 Jeff Owen of Orono negotiates the rapids on the Kenduskeag Stream in Bangor on Dec. 1, 2011. Maine’s whitewater racing season is fast approaching, with the first event of the series scheduled for March 28 on the St. George River. The full race schedule is available at the Maine Canoe and Kayak Racing Association website, mackro.org. In preparation, paddlers are hitting the water, wherever they can find it, to brush up on their skills. Jeff Owen of Orono, for example, can be found in his canoe at least four times a week teaching two youth racing groups: the Orono High School Canoe Racing Team and MACKRO’s Junior Wildwater Team. Owen, who grew up in Orono and has been racing canoes since he was 10 years old, has successfully competed in numerous whitewater races throughout the country. And as the MACKRO official responsible for youth outreach, he has passed on his knowledge and love of the sport to the next generation. In the following Q&A, Owen offers some advice for paddlers planning to participate in Maine’s upcoming canoe and kayak races. BDN: Is there an easy race in the series that you’d suggest for beginner racers? Owen: The bar to compare against would be the Kenduskeag [race] — that’s what most everyone in Maine is familiar with. If I were to describe the Kenduskeag race first, it’s incredibly popular and that’s one of the reasons it’s so fun — because there are so many people out there having a blast and it’s spectator-friendly where the whitewater is the biggest. But it’s also one of the hardest races in the entire circuit. It’s hard due to its length, and there’s some difficult whitewater, and there are two portages. You have to paddle for 10 miles before you get to the whitewater, so your arms are tired by the time you get there. And when you get there, there’s 50 other boats all trying to go through it at the same time. So it’s a really hard race for all of those reasons. The other races are not like that. They are all shorter. The first two are the St. George [River] and the Passy [Passagassawakeag River Race]. Many boats finish in under an hour for both of those races. You don’t have portages; you don’t paddle forever in flat water before you get to the whitewater, and the whitewater itself, once you get into it, is rather continual and comparatively easy. They are far easier — but not as many people know about them. If you want to become better at whitewater racing, those are fantastic options. And a lot of us paddle them the afternoon before; we go down Friday afternoon and paddle the race course, and anyone is welcome to tag along. The day after the Passy is sprint racing through the “Shopping Cart” [rapids] on the Kenduskeag. This is only the second year we’ve been doing this. Not only is the sprint race fun, it also helps people learn how to run those two rapids, so when they come back two weeks later and run the longer race, they know how to position their boats. There are tricks to it, and we want the sprint race to show people what the tricks are. It’s a shame to paddle all that way and tip that close to the finish line. BDN: Are there some spots where people practice before the season, places where ice melts early in the season? Owen: Training is going on right now on Pushaw Stream. In fact, I’m taking my club up there for the first time today. It’s off Route 43, and it’s a spot locally called Twin Bridges. It’s the only spot that stays open all year round, and this time of year, the little tiny stretch that always stays open gets a little bit longer every day. There’s plenty of room for us to paddle back and forth. There are also stretches of the main stem of the Penobscot [River] that are open, but that has a stronger current and is not recommended. There’s also a section on Souadabscook Stream from Hammond Pond to Hermon Pond. BDN: So many people tip their canoes in the whitewater of the Kenduskeag Stream race. Is there a common mistake going on? Owen: One reason a lot of people tip over in the Kenduskeag is the rapids get so clogged up with so many other boats. It’s a race that gets populated by many novice paddlers who get into whitewater and get caught on rocks and tipped upside down, and then the people behind them get caught up, too. So that’s one issue — just the sheer number of people there. It’s such a tradition. It’s just the thing to do in April in Maine to get out of the winter doldrums and celebrate spring time. Success in whitewater is really dependent on anticipating what the river is going to do to your boat and having the skill to compensate for what the river is going to do to your boat — to not always be reacting to things that are happening, but being able to look ahead and being able to avoid them. You simply have to paddle a lot of whitewater to transition from being reactionary to anticipating. A lot of us paddle the whitewater section of the Kenduskeag the afternoon before [the race], and people are welcome to join us. We start right below Six Mile Falls and paddle down through the Shopping Cart. Any time you can follow experienced paddlers and see how they choose their line and handle the whitewater, you can really learn a lot. BDN: Is there a piece or two of gear that you’d suggest to any canoeist in these races? Well, there’s required gear. You have to have a properly fitting PFD on all the time, and kayakers have to have a helmet on the whole time. Having rope attached to the bow or stern that are sort of loosely coiled in your boat is important. You want them secured in the boat so they aren’t tangling around your feet or washing around on the bottom of the boat, but not so tightly that you can’t reach in and grab them easily. And those ropes should never have knots in them. Also, a spare paddle. Those are the basics for equipment. A lot of people don’t realize that if you get off their seat and down onto their knees as they enter whitewater that the boat will be a lot more stable because you lower your center of gravity. If they have a foam pad for their knees at the bottom of the boat, that’s an easy trick that people often don’t know about. If you put floatation bags in your boat, when you tip over, your boat floats much higher in the water. There are two nice consequences of that: 1., It’s less likely to get damaged on rocks. And 2., it makes it a lot easier for you or safety personnel to get the boat. But a lot of people don’t put [float bags] in properly; they have to be really secured to the boat … they actually have to be compressed below the gunnels and secured. BDN: How can you prevent water from flooding your boat? Water will get into your boat no matter what. Carry a bailer or two bailers to get it back out as quickly as you can when it comes in. BDN: Do you have any other suggestions for preparing for these races? Come to the early races and you can learn so much. Even the weekend after the Passy [on April 4], the Souadabscook [Stream] and Marsh Stream races [on April 11 and 12] offer shorter courses that stop before the really big whitewater. That’s a good option for less experienced racers.